This is a mini PCI-E extension cable to solve the problem that the interface is warded off or the interface is too close to the display card. No external power supply is needed. 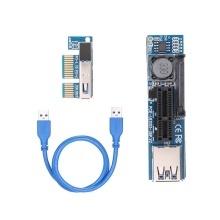 This item is suitable for mini PCI-e slot. Flexible cable for easy use.